Since when did knowing about a single subject become a bad thing? If you expect to be a prominent member of the Boston sports media today, apparently it is. 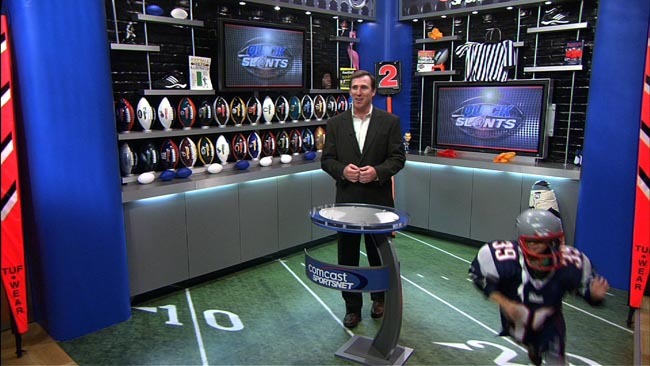 I’m a big fan of Comcast Sports New England in general and really like their Sports Sunday show, hosted by Michael Felger about 99% of the time. This past Sunday, their lead New England Patriots/NFL guy Tom E. Curran hosted the show, perhaps a graduation of sorts for the guy that just wrapped up his debut season hosting a Patriots-only for the network (seen above). But why wasn’t Gary Tanguay, Andy Gresh or another one of the sports-neutral hosts from their other telecasts chosen instead? I’m not sure, but the Curran appearance closed out a week in which a former Red Sox utility infielder got a hotly desired midday radio spot, joining a group of guys that are being painted as knowledgeable about everything despite having intense knowledge of a singular thing. Is the era of the expert dying? In the “old days”, it was the host and the expert, playing off a relationship similar to how the straight man sets up the jester in comedy bits. This dynamic still exists for the most part as broadcasters have hours and hours of content to fill and need well-spoken people with a superb level of intellect on their shows to opine about the subject at hand. For experts, they get a chance to flex their muscle and be known for something. If they were good, they were asked to be on other shows. They may have even got more work out of their appearances. Simply put, they got to talk about what they (seemingly) loved while expanding their brand a bit. That’s the idea but over time, things have changed. Experts were asked if they could expand their reach and in the era of the 500-channel universe and the internet, hosts found themselves in competition with the very experts they used to question. Now it’s about personalities, not level of knowledge. Fans are accustomed to less-than-expert level conversation because they know they can always get the detailed dish somewhere else. The internet is a wonderful thing like that. As a result, guys like Lou Merloni have been given a chance to stretch their wings a bit. 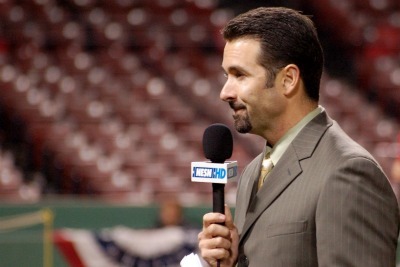 As the rumored new midday host for WEEI following their shakeup, the Providence, RI, native (seen above) has truly come full circle, dizzying considering that he was just a run-of-the-mill baseball player turned likable baseball analyst. Now he’s a player in one of the most hotly contested media circuits in the world. But while he understands about the intracieis of baseball, Merloni has never been called out for his knowledge of the Celtics or Bruins or held up to the standard of other hosts. He just kinda started appearing on WEEI’s The Big Show and other programs, getting more airtime and eventually guest hosting those shows. Curran got the nod to guest host Sunday, despite his seemingly-singular focus on the Patriots and football in general. Is he looking to crossover as well? Why do his opionions on the Red Sox matter as opposed to someonese else and if he’s put in the position to give opinions on other sports, shouldn’t he be held up to the same standard as anyone else or would he get a free pass as ‘the Patriots guy’? Maybe that’s my issue: the standard. Why can’t they just be experts? Is there something wrong with being good at one thing? It almost feels like one-trick ponies are being seen as just that, while guys who have no background in all sports are being allowed to coast through unchecked because they’re popular. Will Sean McAdam be expected to talk Celtics soon? Should Gord Kluzak brush up on his Tom Brady knowledge? I think that host/expert dynamic is a good thing, not something to run away from. I don’t need to hear Scott Zolak talk about the Red Sox, but I would like to hear his perspective on the Patriots from the angle of a guy that used be under center. Instead, he’s co-hosting the midday show on the Sports Hub with Gresh which comes off as more like a football locker room than radio show. I want Zolak to be the best football analyst he can be, not become average at his Boston sports knowledge. The host should be average and hence, why the experts exist in the first place. The host is the one that is playing the role of listener at home, asking questions that need to be asked and understood. That’s the idea, or at least, it used to be. If I’m tuning into a show, I want to think the people I’m listening to know more than I do, not at a similar level. (Insert joke from friends here). More and more, I’m getting that impression that’s not a big deal for Boston media heads. Maybe that explains why former soccer player Taylor Twellman continues to have a gig on CSNNE despite knowing less than most middle-school males about the scene here. Then again, Boston Globe scribe Chris Gasper — who used to be Patriots only — apparently now talks about everything and found himself on ESPN’s Sports Reporters on the same Sunday Curran hosted his show. Maybe I need to expand out and learn about jai lai or horse racing instead of this MMA business. Josh Nason is a New England-based freelance MMA journalist that currently has a Jon Fitch feature in February’s FIGHT! Magazine. He frequently does radio/podcast appearances and asks for your “like” for ESPN Boston to cover MMA. Follow him on Twitter. I returned to the pages of FIGHT! 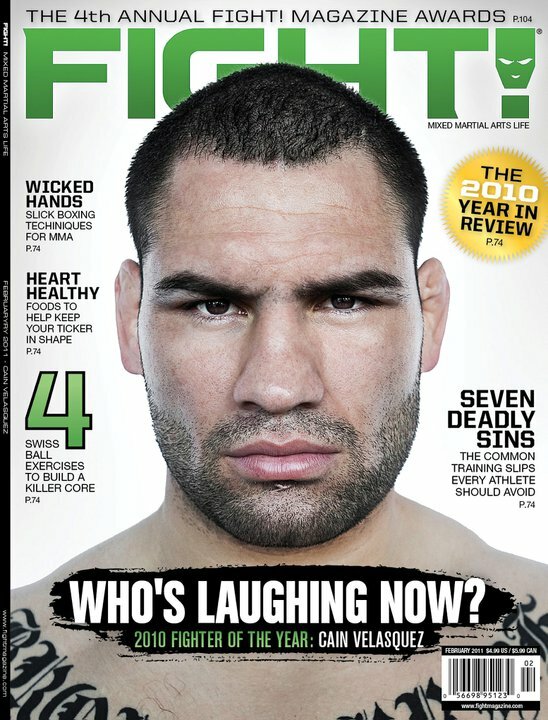 Magazine, the world’s largest mixed martial arts publication, in February with a feature on UFC welterweight Jon Fitch. Fitch is set to face former UFC Lightweight/Welterweight champion BJ Penn in the main event of UFC 127 in Sydney, Australia. We talked about the importance of the Penn fight, the evolution of his fighting style and misconceptions about style over substance. I also interviewed AKA jiu-jitsu coach Dave Camarillo who coached Penn in the fighter’s early days at AKA and even co-authored a book on BJJ with him. Fun story that you can read this month in February’s FIGHT! Magazine. Got a few new posts around the interwebs and need to make a commitment to post those here. Long feature for B/R on Frazer, a FIGHT! Magazine journalist who has been pushing forward with an MMA movie he’s been dying to make. This is quite a story and one that anyone sitting on pushing forward with their dream should read. A notebook wrap from the recent UFC event and why I think Anderson Silva vs. Jon Jones could be an un-freakin-believable fight in 2012. You can’t plan a viral video, dummy. It just happens. My debut post for InboundStrategy.com on why you can’t plan out a viral video. That’s part of the charm: it just happens on its own. January 29th appearance on The Fight Network’s Review-An-Impact. Fun show where I talk Strikeforce and what would get me back as a pro wrestling fan. Josh Nason is a freelance journalist whose work has appeared in FIGHT! Magazine, CBSSports.com, BleacherReport.com and MarketingProfs.com. Support his cause to get ESPNBoston.com to cover MMA, follow him and check out his audio archive of appearances.